"Larry traveled back in time to retire. He’s a cop, or rather, was a cop from the year 3000. He likes our time, he can relax, and nobody bothers him about his jumpsuit..."
Zen Moment-The V-Twin (with lucky lady) belt buckle. 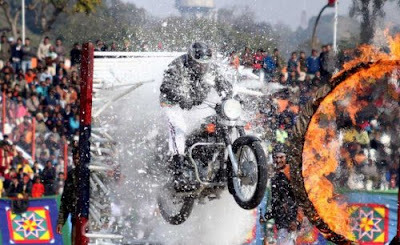 "Jammu and Kashmir police officers on a motorcycle display Dare Devil skills during Republic Day celebrations in the Northern Indian city of Jammu, the winter capital of Kashmir on 26 January, 2008." 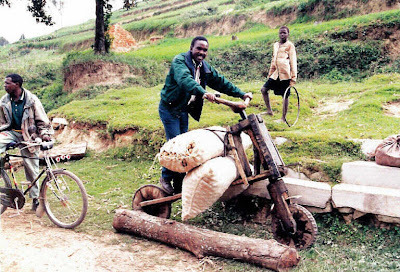 Gallery: Wooden Bicycles in East Africa. 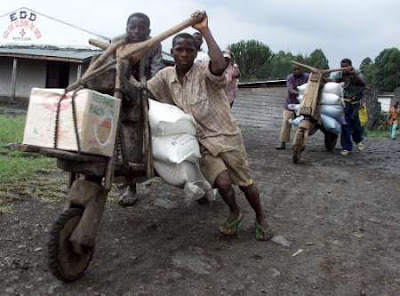 Congolese residents in the devastated town of Goma push makeshift bikes bearing food supplies. The Art of Jason Watt. 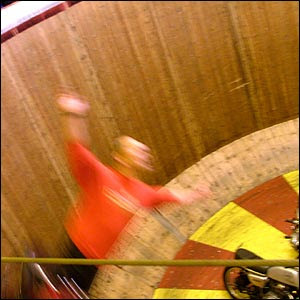 "What the inventor of the Wall Autowheel did not anticipate". "A W Wall's first Autowheel had a horizontal engine of 1½" bore and 2" stroke was air-cooled, two-stroke, flat twin in which only one cylinder fired; the other pumped the charge into the active cylinder. 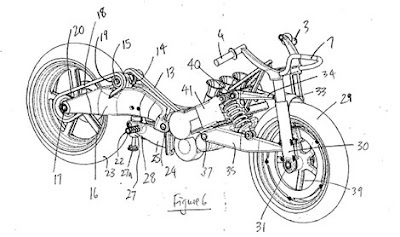 The hub contained a flywheel and 6:1 reduction gears.The oil and petrol tank was in the mudguard. 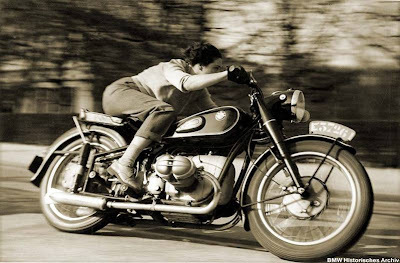 Later models used a more conventional motor." 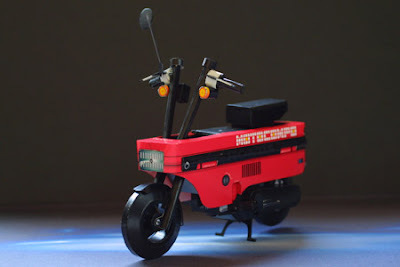 Fold tab a into slot b: Tanaka's Paper Model Motocompo. 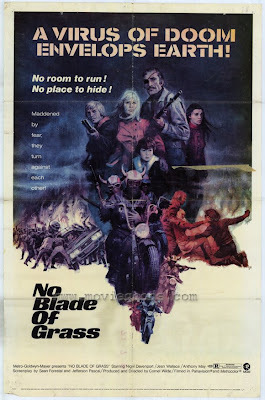 The motorcycle in cinema-No blade of grass. The night of the Logust. 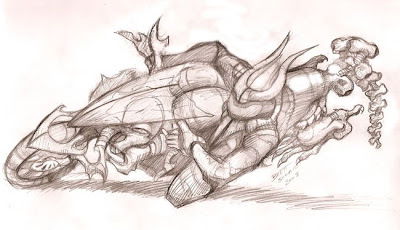 Salvador Gonazalez's AC Tricera concept. 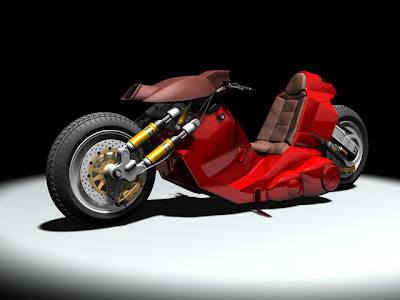 "Salvador Gonazalez, has designed a self-standing entry-level electric sports bike. 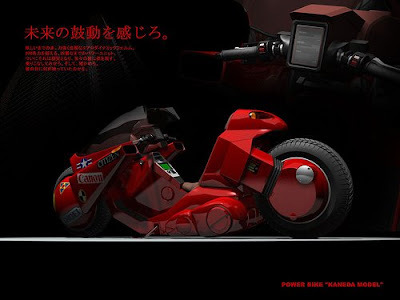 Powered by an electric motor, it is designed for environmentally conscious and socially responsible riders who still want excitement of sports bikes with safety and extra-conveniences. There is nothing more tragic than dropping your bike when you buy it new! 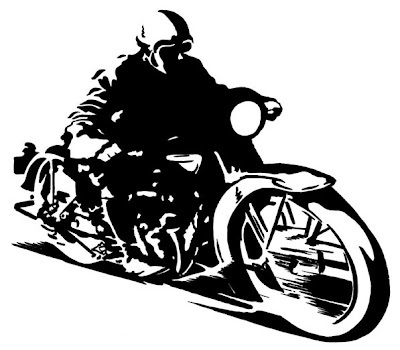 In addition the main fear for a rider is injury due to being exposed to the road and other vehicles. 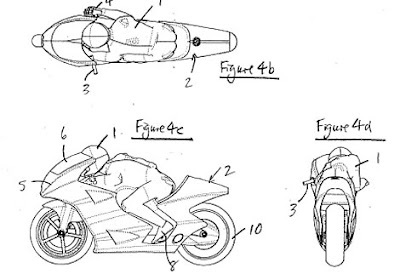 To address these issues Gonzalez designed an external structure that, in initial sketches at least, protects the rider overhead with a cover and on the sides with butterfly side guards. Unlike other vehicles that have recently entered the market with the stabilizing three-wheel configuration the Tricera retains a sporty and aggressive stance." "Can something be so rad that it breaks my heart in two? yes. 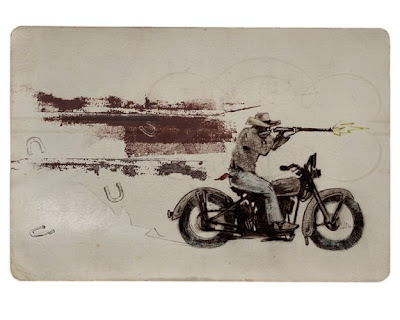 a shotgun-toting cowboy riding a motorcycle with the soul of a horse is one of those things." 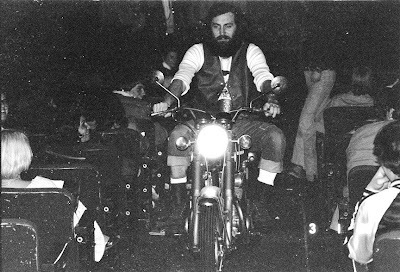 "The photo above documents one of Larry Rohr's rides through the auditorium during a midnight screening of "The Rocky Horror Picture Show." Larry only performed his feat on special occasions, such a anniversaries, etc. This time it was for the night that "Rocky" broke the local record for consecutive weeks that a movie played at the same theater." Here's Diesel, my sewing machine hero, speeding along in a fashionable motorcycle. This heather grey hooded tank top is handprinted with a Gocco. 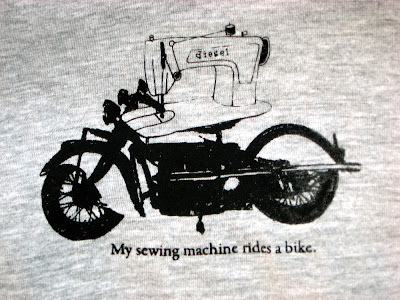 My original design shows Diesel on his motorcycle with the caption, "My sewing machine rides a bike." The shirt looks great both on its own and layered. It's sweatshop free, made by American Apparel, and is a 90% cotton/10% polyester blend. It has a pocket on the front, as well." Gallery: Doug Malewicki's Skycycle memories. 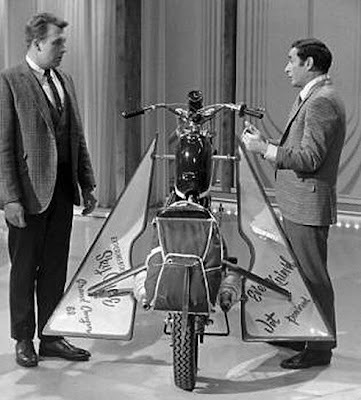 "Doug Malewicki was the designer and engineer of Evel Knievel's steam rocket powered SkyCycle X-1 canyon jumping motorcycle. 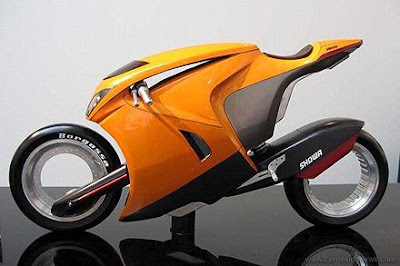 Theoretically - a two wheeled, streamlined, fin stabilized rocket that is capable of rolling along on those wheels could be deemed a "Motorcycle". Similarly, launching and flying across the Snake River Canyon could also be deemed a "jump". Poised here for action is the model of the canyon jumping X-1 Skycycle "Motorcycle" Malewicki designed for famous daredevil Evel Knievel in the early 1970's." 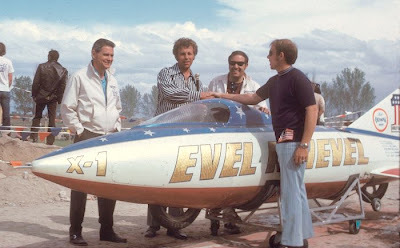 "Malewicki is shown here shaking hands with Evel at the machine's unveiling at the Twin Falls, Idaho Snake River Canyon jump site on May 6, 1972. On the left is Robert Truax who invented and holds the patents on Steam Rocket engines. 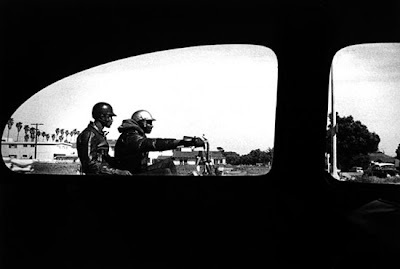 In the background wearing sunglasses is Facundo Campoy, one of Truax's partners." 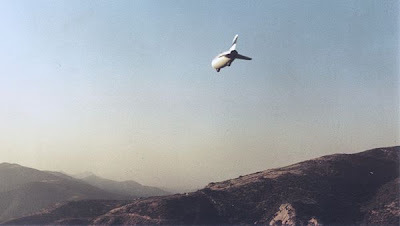 Photo of model test launch #3. Evel is ready to push the electric ignition button. 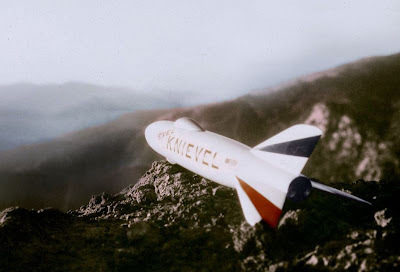 The Skycycle that never was: Knievel's first promotional (and painfully bogus) bike that inspired Malewicki to contact the daredevil to assist in creating a more "functional" Skycycle. 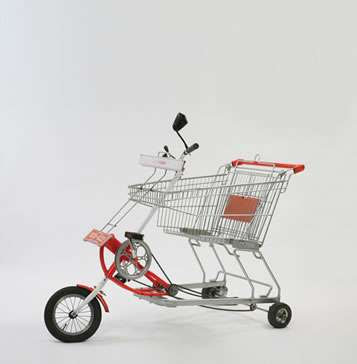 "If Korean designer Jaebeom Jeong has his way, the supermarket aisles will become a grand prix race track for children who love his shopping cart bike. The Cartrider came about because the designer noticed that parents often put their children in the carts while shopping. 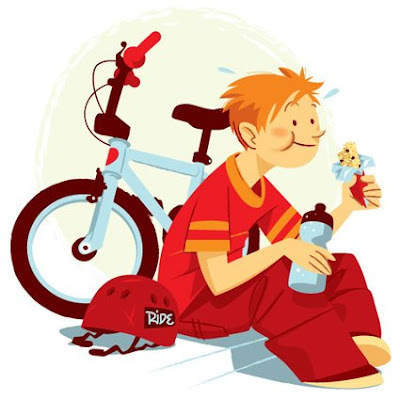 He envisions his Cartrider to be used by children as they accompany their parents on boring grocery shopping trips." 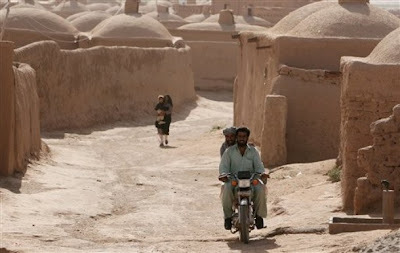 "Two Afghan men on a motorcycle pass red mud houses in Bunyat village where 350 widows live in Herat province, Afghanistan, on Thursday, June 7 2007. About 1,000 to 1,200 families live in Bunyat, and local elders have counted about 350 widows among these families. It is an impoverished village, built entirely of red mud with domed roofs, about 40 kilometers (25 miles) from the main road across wild wind-swept desert plateau." 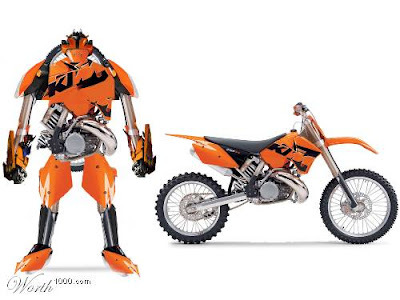 Austria's answer to the Transformers comes to light. 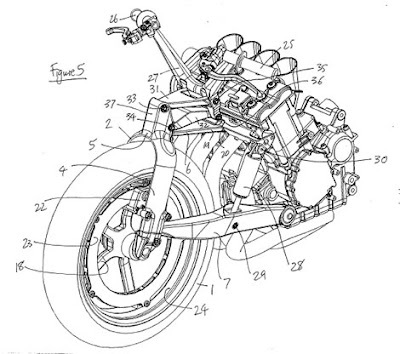 Strange motorcycle engines: The Granville Bradshaw Omega. "Late in 1955, came the Omega engine, which was of a rotary form, ingenious and most unusual. It was difficult to see how it worked at all, but the design was intended to reduce the inertial loadings of the conventional layout. The design was based on an annular cylinder, formed from two light-alloy castings bolted together. Within these was formed a toroidal chamber, which can be likened to an inner tube or an O-ring, being a ring with a round cross- section. For the Omega, the working surface was hard chrome plated and within it were four double- ended pistons with rings at each end and a shape to match the toroid. Each opposing pair was joined by a cross-link, and each of these was bolted to one of two concentric shafts. These each had a short arm at the other end, with a connecting rod to join that to a 180-degree, two- throw crankshaft. As this turned, the links caused the pistons to move some 30 degrees back and forth, so the space between the opposing crowns varied. If this was not enough, the entire cylinder also rotated at half crankshaft speed and was driven from this by helical gears. In its sides were cut inlet and exhaust ports, and the single sparking plug was screwed into the side. Lubrication was by petroil, with a separate system for the crankshaft, and cooling was by fins on the toroid and enclosure to guide the air. The Omega was the final fling of a man whose ideas were always clever and innovative, but who sadly failed to understand the commercial needs of the business. 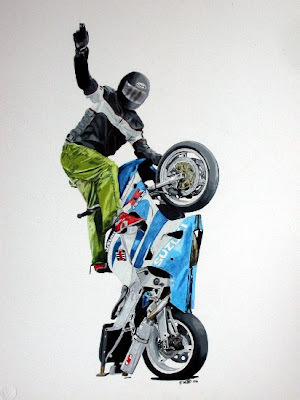 His designs were novel, but invariably costly and seldom trouble-free, so his long involvement with the industry made news and kept everyone intrigued, rather than pro- ducing machines for riding. Without such men, the world would be the poorer." 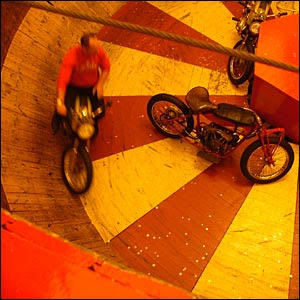 Gallery: The wall of death. 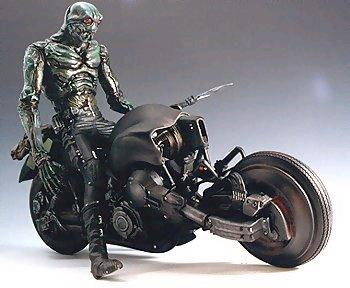 When is a motorcycle not a motorcycle? 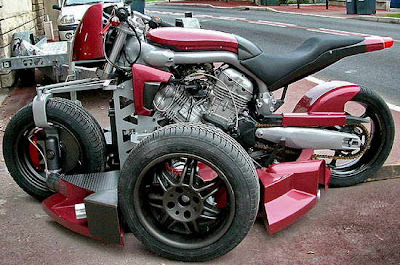 Alain Deveze's K-Pteron. Both sides of the K-Pteron are platforms. 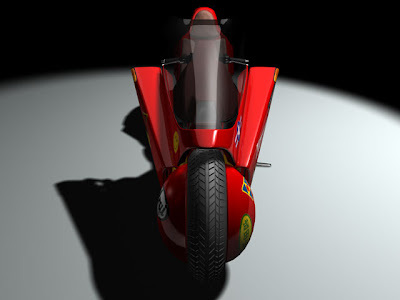 You ride the K-Pteron like you would a sidecar, and with all three wheels used for steering, you can take the curves very sharply, so it's very maneuverable." Note: The McCain riding lawnmower was unavailable for comment. 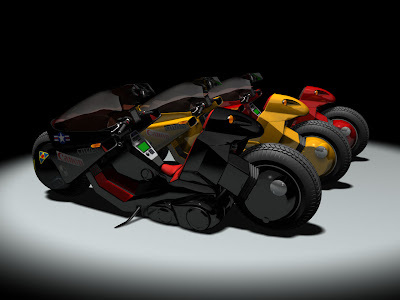 Patent art: Ecosse Spirit ES1. 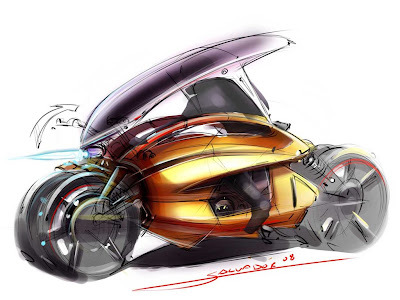 "The design of the Borgossa motorcycle encapsulates the beauty of mechanical elements and diverse sculptural forms. 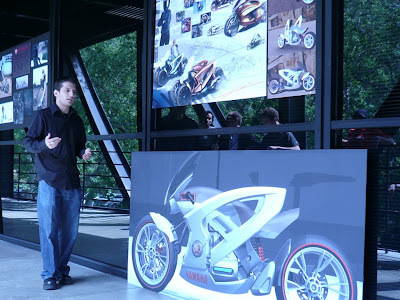 Designed around a hub-less wheel configuration, the motorcycle's unique shape integrates the rider seamlessly into the design to unite both human and vehicle as one unified object. 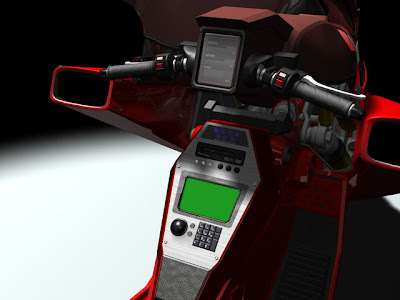 The streamlined riding position and practical design functions allow the user to customize the motorcycle to attain maximum performance from its powerful 1000cc engine. 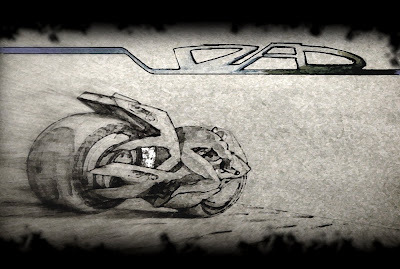 Inspired by cyborgs, the design reflects the close relationship between man and machine, whilst challenging the current style of sports motorcycles." Hows the air up there? 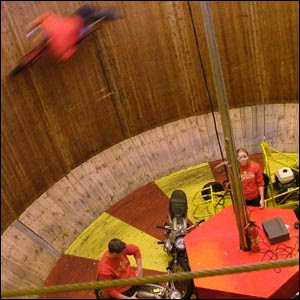 The AirBike. The art of Logan Kelly. flickr: JJ - Circle Wheelies. 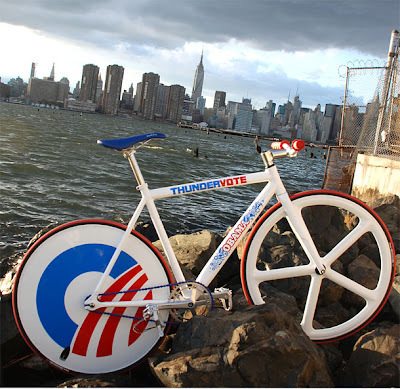 The adage is wrong: You can take it with you. Family photo's: Dune riding in the sixties. Graffiti Research Lab's Mobile Broadcast Unit. 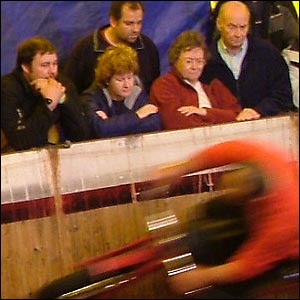 Two to Five men on a motorcycle. Revolution of the species-Pt 2. 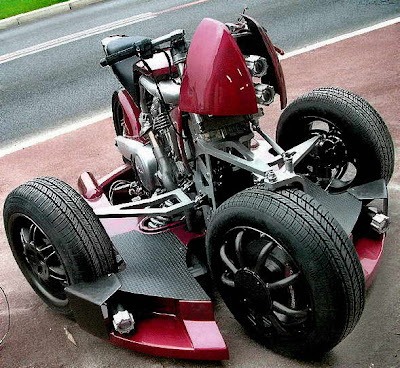 Wyatt Turner's Battle AX / Concept Bike. The Art of Bruce Gray. Comic Panels: Ghost Rider #20. 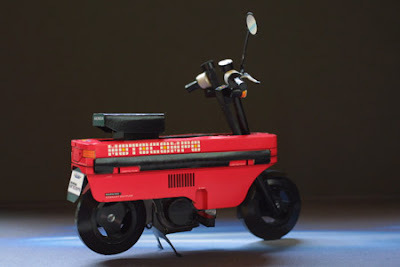 Game on-Gosuke Factory GTA download models. Gone but not forgotten-The IRS 1000. 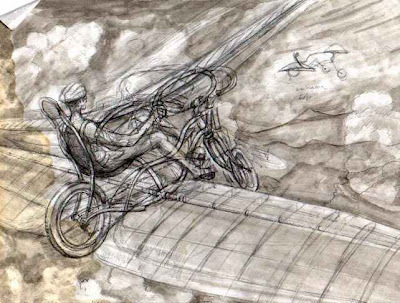 Chocks away: The 1914 Aerothrust. 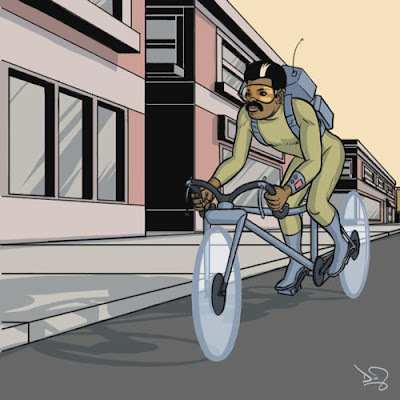 Buy me that!-Kiki & Tombo's Propeller Bicycle.